You may be wondering, is a safety partition (aka safety barriers or bulkheads) actually needed in my new cargo van? Often a new van comes with stock one or else the upfitting package you have chosen comes standard with one. This may appear like an extra cost that isn’t required. We get this question quite often, so here are some solid facts to help explain why you do need a safety partition. In case this wasn’t obvious, your safety (or your technician’s safety) is important when driving from job site to job site with equipment in the back of your van. But you secure most of the heavy stuff and the light stuff could never do any damage, right? That’s a lot, and they are talking about ordinary objects like a phone or that Big Gulp. The impact of a 20 lb object traveling at 55 mph is equivalent to 1000 lbs of force. Imagine having to slam on the brakes while on the highway. What’s going to happen to that tool box you threw in the back of your van and didn’t bother to secure it? A solid barrier between you and your cargo is a must to ensure you keep safe in the event of a sudden stop or even a collision. Safety Barriers also provide an unbelievable amount of added comfort to you as a driver. The noise of stuff rattling in the back can be enough to drive any one crazy. Not only is this annoying but can often be quite distracting. A Safety barrier also acts as a sound barrier from noise in the back of your cargo van. Be careful not to get a thin gauge steel partition that will rattle louder than any cargo in the back of your van! Keeping warm in winter and cool in the summer can be a challenge with a larger cargo van. Your heater and AC can take a long time to give you your optimal temperature. A safety barrier cuts down the space the Heater or AC need to warm up or cool down which ultimately gets you to the optimal temperature much much quicker. As humans we usually appreciate breathing good clean oxygen. When carrying around chemicals, cleaners or anything that produces fumes it can be annoying as well as dangerous if you don’t have good air flow. A safety barrier can reduce the amount of fumes you breathe and with the addition of a roof vent this will eliminate those weird headaches you acquire after a long commute. We trust this helps assure you that a safety partition is a much needed component of your next cargo van upfit. If you have just purchased a van and need a partition check out the options here. Is it unlawful, for your employer to remove the partition from your work van? We are located in British Columbia Canada, In our area not having a partition in the van is punishable by up to a $1000 fine. 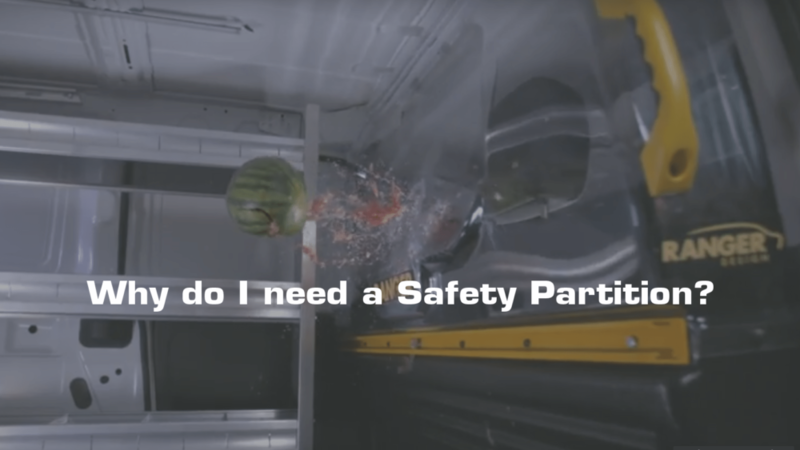 overall it is very unsafe to operate a van that has tools or objects in the back without a partition.